That’s sage and golden marjoram behind the sketchbook, I photographed it in my herb pot in the garden. Too warm for me today, temperature around 21 Celsius, so Husb and I didn’t get down to the allotment until about 4pm, when it was staring to cool off a bit and I could do a load of digging without flaking out. Our allotment is on a site sandwiched between two woodland glades and right behind the 12th century Oystermouth Castle in Mumbles. It’s an idyllic setting but the soil is poor, a heavy clay and very hard to cultivate. But it’s good exercise and we generally harvest a good crop of fruits. Most veg need a lighter soil so we’ve built some raised beds and we’ve had moderate success with leeks, chard, rocket, potatoes, runner beans and broad beans. I’m trying out some beetroot and peas this year. Brassicas are a non-starter; as well as the poor soil, everything eats them. 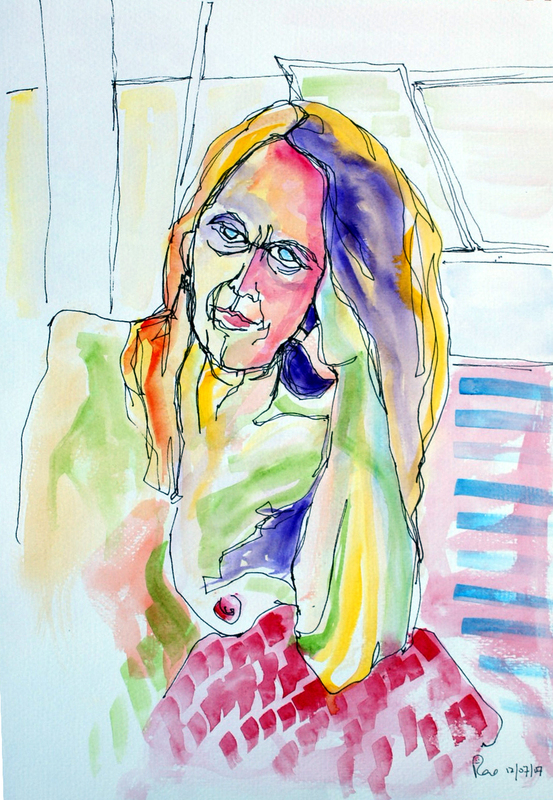 If you would like to see some of my other artworks, please click here. I spent almost all of September at The Bagpuss Window, a semi-derelict shop that became a spontaneous artspace for a few weeks before demolition. Ironically, after our awful summer of torrential rain, September was glorious and I was stuck indoors for most of it. I took the keys back to the owners last Thursday and spent the next 3 days taking an allotment break. It’s been neglected and needs a lot of maintenance as well as catching up with some Autumn sowing. It’s been lovely to be in the fresh air and gentle late sunshine, digging for hours. I love digging, I could do it all day. I planted some Meteor peas today and a late sowing of kale yesterday. I shovelled some manure onto a bed to lie fallow for a month or so, ready for a November sowing of Aquadulce broad beans. Rain is forecast for the next couple of days so I can stay in and take stock of everything that happened at The Bagpuss Window. I took loads of photos and did a lot of filming so I need to start collating all the images and then decide what I’m going to do with them. So much happened and it would be a shame not to document and publish it. Here’s a detail of the large wall drawing I did. Most of it was spontaneous and done under the influence of gong music. More of that to come…..
Today there was sunshine! After a month of monsoon we had a dry day so Husb and I tackled our back garden, which had grown into a lush jungle after all the torrential rain throughout August (apparently the wettest August since records began). It’s become so overgrown that we spotted a huge rat hiding in it a couple of days ago. We did about 6 hours and my Felco secateurs were so over-used that I now have a bruised and painful right hand. That’ll teach me. An artist without a usable hand is pretty useless! I’ll rub some Arnica cream in before bed. Went to visit Mam-in-Law later and she’d foraged about 3 pounds of plums so I’ve got a pot of plum chutney simmering on the stove. Husb had to help me cut up the fruit because my hand is so sore. I used a recipe from Mam-in-Law’s old cookery book that was published over 60 years ago. I adapted it to modern tastes; garlic wasn’t common back then and I used fresh instead of ground ginger and wine vinegar instead of malt. I’ll be putting it into jars about 11pm, but it’s worth the effort. There’s nothing quite like cheese on toast with home-made chutney. 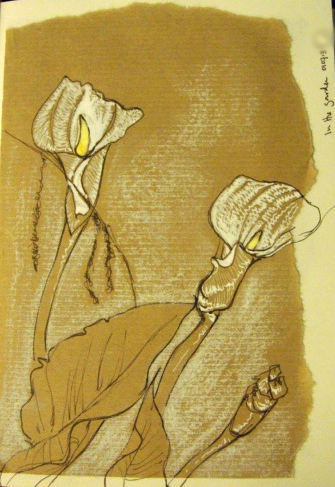 ….or the Arum Lily. I have a clump of them in my little wildlife pond in the garden and as it was such a glorious afternoon, I popped out and sketched for 10 minutes or so. I don’t like being out longer becaue I’m a gingery Celt and burn in the sun. 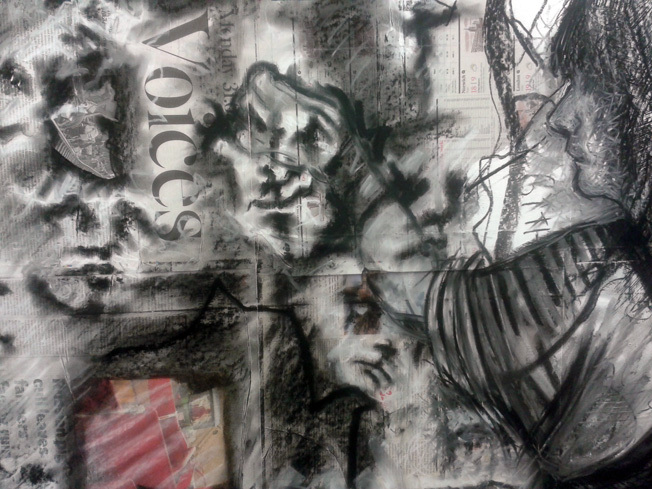 I have been pasting pieces of ripped brown wrapping paper into my sketchbook, to break up the tyrrany of the white page. I drew the outline with a Faber Castell Pitt drawing pen, size F in sepia and worked up the layers of white with Winsor & Newton drawing ink and a dip pen. The background has a smudge of white conte crayon and each spadix coloured with W&N yellow drawing ink. Husb and I spent most of the afternoon and evening down at the allotment, because it’s dry and sunny and we are making the most of it. Our allotment is below a Norman Castle, which is really quite a spectacular setting for growing some fruit and veg. 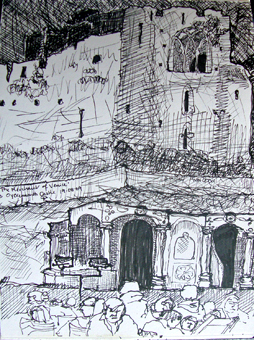 Here’s a drawing I did of it a while back, during an evening outdoor performance of Shakespeare. 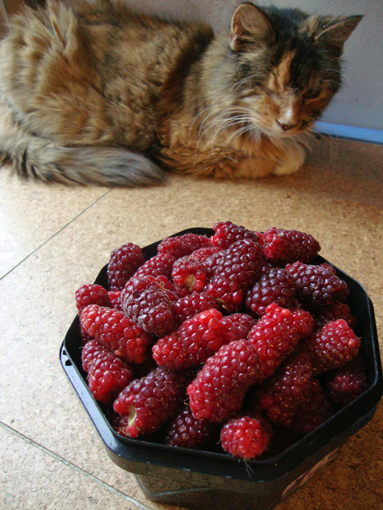 Does what it says on the tin – here’s a cat – and some berries :D. I did loads of drawings at the studio today and forgot to photograph them, so no drawings to blog tonight. But I have two of my favourite things to blog about instead – cats and gardening. These are loganberries picked this evening from my very small back garden. There’s about a pound and a half here and I’ve been picking a similar amount for about a week, with loads more ripening. Most of them will end up as home-made jam because we get tired of eating them fresh and loganberry jam is one of the most delicious things on the planet. We have an enclosed garden with tall Victorian stone walls. The loganberries are climbing up a south-facing wall and the microclimate is perfect for them. There’s a fig tree next to them and rhubarb below. And here’s Little Ming in the background, not very pleased because I’ve been ambushing her with the brush whenever I can and she doesn’t like it one little bit. But it’s better than furballs. She doesn’t think so though. Today was one of the rare sunny days this summer, so Husb was up and out early getting a run along the promenade. Then a seagull spotted him. Literally. All over his head. I couldn’t stop laughing :D. Luckily he doesn’t have the thick verdant growth of his youth and he was able to scrape most of the gull droppings off his pate and carried on with his run. After he cleaned up, we took advantage of the respite from the storms and headed off to the allotment – weeds thrive on persistent rain. I embarked on a war of attrition on the buttercups, hogweed, dock, speedwell, rosebay willowherb and scarlet pimpernel and before anyone complains that they’re just flowers in the wrong place – WRONG! They’re EVIL! And they’re trying to kill our allotment. I showed ’em no mercy! We had a break to sup some of our recently made elderflower cordial [we’re lucky to have a sambucus nigra overhanging the plot] and we crushed some fresh mint leaves into it – delicious. 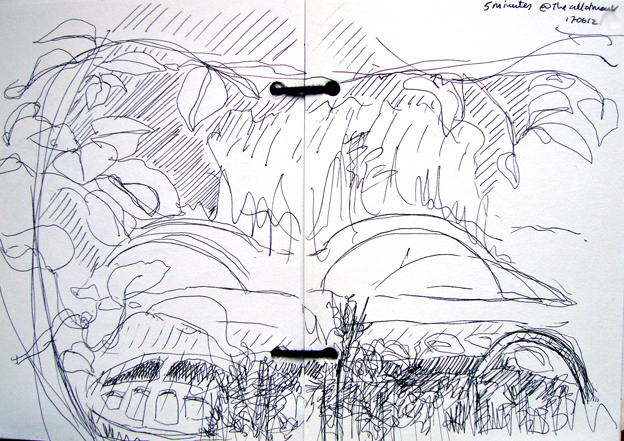 I took a few minutes out to scribble this view from where we were sitting in front of our shed, looking through the lush growth of the Kiwi fruit plant ‘Jenny’, a self-fertile variety which is producing flower buds for the first time this year. Just under it is a large bin full of nettle compost; steep as many nettles as you can cram into a bin in water for a couple of weeks and the resulting evil-smelling brew is a highly nutritious liquid compost that can be applied with a watering can. Makes me smell awful though. But never mind, not as bad as seagull poo on the head, eh? It’s hard to draw nature so I’ve been looking at how Van Gogh did it. He developed his own shorthand of marks to interpret what he saw and seems to have drawn very quickly. I’ve a long way to go, but that’s how I’m approaching the great outdoors. Faber Castell Pitt drawing pen, size S, into an A6 leather-bound, recycled sketchpad, used double. I dug some out and spread it around the rhubarb which is growing away very nicely – might have some for crumble in a couple of weeks. It grows really well in the back garden but didn’t like the allotment at all when I tried it. It’s really expensive in the shops these days but we get so much of it each year that I have to make chutney. It’s delicious. Here’s the recipe. Great with cold meats, cheddar, cheese on toast, smoked fish, curry. Put everything into a very large pan and bring to the boil. Cook at a good simmer for at least an hour until it is thick, stirring occasionally. Pour into clean, hot jars and screw the lid on immediately (use waxed and cellophane jamming circles if you have some). Label and date and store for at least a month before using, if you can resist it. The drawing was done with Faber Castell Pitt pen size S and a lump of graphite. 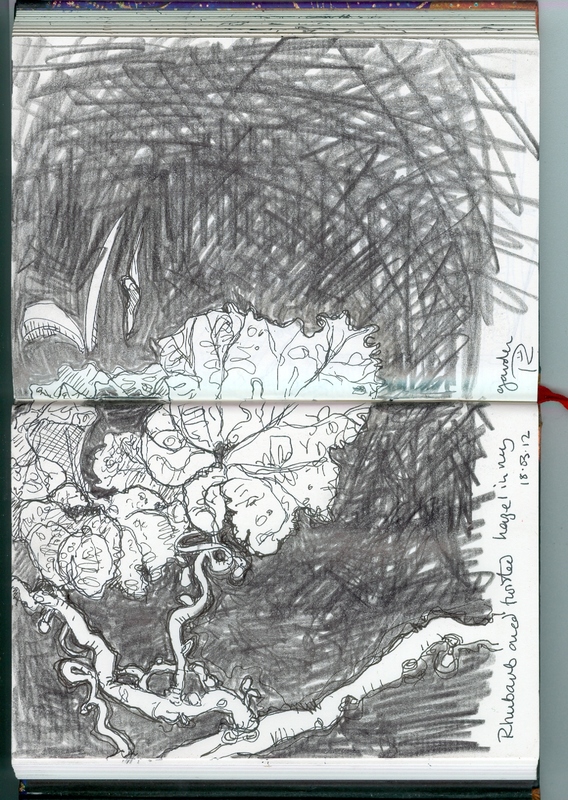 I have a twisted hazel [corylus avellana ‘Contorta’] in a large pot in front of the rhubarb patch and I drew through some of the little twisted branches. In the background are a couple of Spanish bluebells [hyacinthoides hispanica] spearing through the ground. They were already here when we moved in and although pretty are also very invasive.